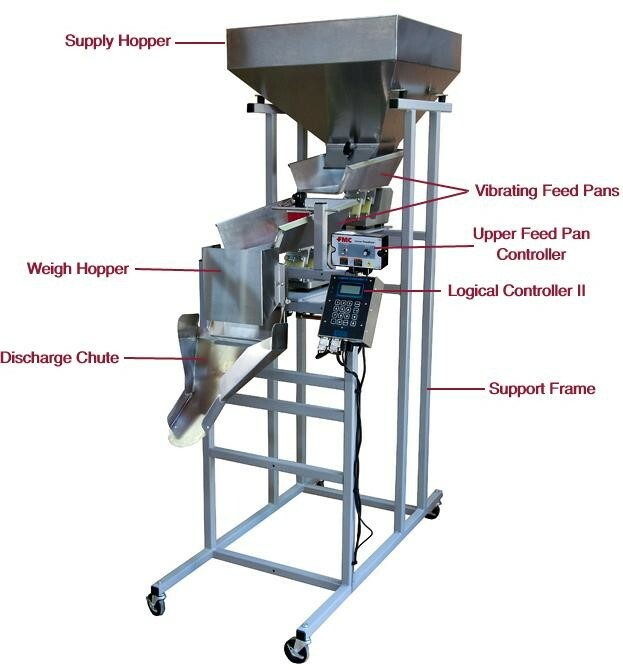 New Cascading Weigh Filler Model S-6 includes: •	Cascading feed pans •	Self-adjusting controller •	Reads out to 1 gram or .001 lbs. •	Controller range up to 10 lbs. •	Supply hopper 3.5 cu.ft. •	All product surfaces 304 stainless steel •	Discharge Chute •	Support Frame: o	Powder Coated o	Footprint 7.5 sq.ft., 74.5" high o	4 locking casters •	120V, 60Hz (240V, 50Hz option) •	Handles all dry bulk products from powders to large parts •	Compatible with all bags, rigid containers, and bagging machines •	Automatic tare adjustment •	On-the-fly, self-adjusting bulk & dribble speed control •	600-800 fills/hour Information: Designed to fill harder to run products such as crackers, chips and other non-free-flowing products. A very accurate and easy to use control system monitors the product depth in the lower pan allowing for consistent filling. The S-6 utilizes many of the Logical Controller II, for reliable, hassle free operation. Specifications: •	Overall height: 6'3" (75"), occupies only 24" x 48" of floor space •	Hopper Size: 24" x 24" (3.5 cu.ft. product capacity) •	Scale Total Weight: 240 lbs. •	Power Requirement: 7 Amps, 120 Volts AC 60Hz •	Air Requirements: <0.25 cfm air supply at 30psi Delivery Timeframe: 4-5 Weeks.